In this tutorial we are going to play with our hierarchy window, and add a toggle button into the hierarchywindow to quickly activate and deavtivate our gameobjects.Before we begin, you can download the source code from github. 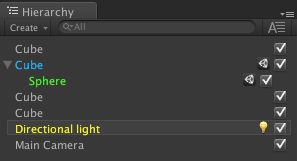 First we need an editor script that loads on every time Unity opens. Then we need a callback for every visible items OnGUI inside HierarchyWindow. After handling callback we need to get the gameObject of items. Then we need to draw a toggle button to fill setActive() methods parameter for every hierarchy item. So lets begin. First lets create our script called “HierarchQuickSetActive”. You can find it inside /Assets/Tut-4-PlayingWithHierarchy/Editor folder. It’s so simple. Just place InitializeOnLoadAttribute for your class. One of our parameter for hierarchWindowOnGUI method is instanceID, you can see instance ids from your inspector tab selecting debug mode on the right corner.Those instance id’s are unique for every scene for every object and changes every time unity opens.To find the gameobjects from them EditorUtility class has a method called InstanceIDToObject thats what we need. The second parameter of our method is Rect. This rect is hierarchy windows gui rectangle. To make a toggle button or any other gui element we can create a new rectangle from this rect. It’s a small rect at right of each item over hierarchy window. Here is the final code for our quick setactive button. /// Initializer <see cref="HierarchQuickSetActive"/> class.